Paw Print Genetics now offers 10 coat color tests and 4 trait tests. With these additions, we now offer the most comprehensive menu for mutations in both disease genes and trait genes. To help navigate the complexities of coat color genetics, we developed a color diagram to help you better understand how these genes interact to produce the variety of coat colors seen in dogs. Finally, on March 31, 2015, we won our case with the judge ruling that the patent for EIC was invalid. Although demonstrated several times in human genetics, with the breast cancer gene case being the most celebrated, our case was the first to invalidate a gene patent for dogs. This victory ended our litigation over EIC and allowed EIC testing from Paw Print Genetics to be certified by the Orthopedic Foundation for Animals. Although you now have a choice as to where to send your EIC testing because our victory was a win for all canine laboratories, we appreciate you choosing Paw Print Genetics for your EIC testing. None of these accomplishments would have been possible without the support of our amazing customers. Friend referrals continue to be the number one way for people to find us; friend referrals are the biggest compliment a company can receive! Thank you for your continued support of Paw Print Genetics. 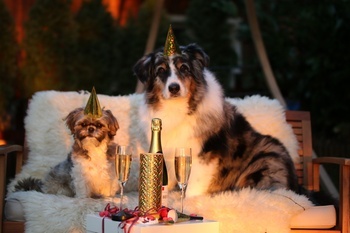 We are excited for 2016 and will continue to be the leader in canine genetic testing. We are honored to support you, the responsible breeder, in your quest for breeding healthy dogs.